RURAL JOHNSON COUNTY — A group of advocates from the county seat is expected to arrive in nearby Solon for tonight’s city council meeting at 5:30 p.m.
On the agenda is an ordinance by which the City of Solon would opt out of the county mandate to raise the minimum wage from $7.25 per hour to $10.10 by Jan. 1, 2017. The Center for Worker Justice is leading a direct action to confront the city council about their potential decision. The center is organizing a car pool to the council meeting from their facility in Iowa City. The story is gaining corporate media attention as Fox News/KGAN2 sent correspondent Matt Hammill to Solon yesterday. 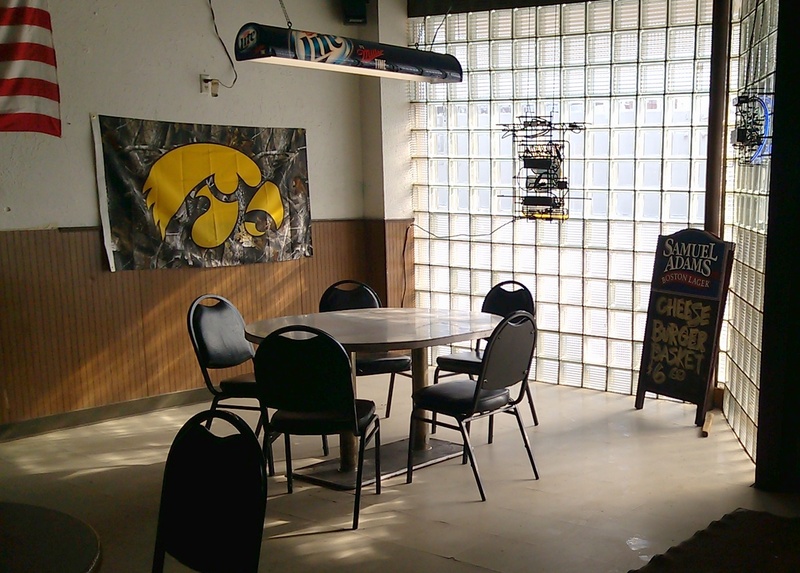 Hammill interviewed Sam Lensing, owner, Sam’s Main Street Market. It is noteworthy that Lensing points to the challenge others would have. Read and view Hammill’s report here. The bright shiny object in Solon is the growing number of restaurant start-ups within city limits. By my count, there are nine places to get a bite to eat on Main Street and several more located in strip malls around town. Both city councilors and advocates are aware of this aspect of city life. The approach taken by advocates for the county minimum wage ordinance is an adventure in mau-mauing the city council. 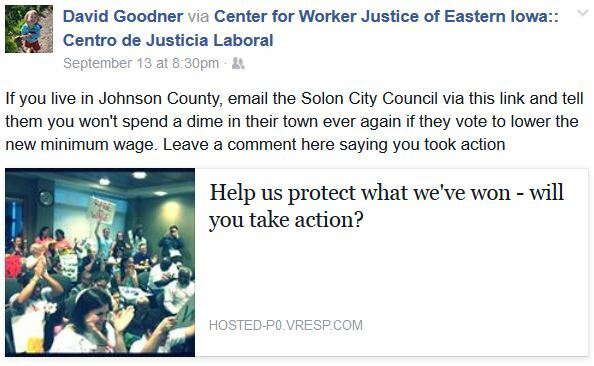 Councilors are unlikely to be influenced by these tactics unless Solon residents step forward to advocate support for the county ordinance. To date, no one has done so. The face of poverty is invisible in Solon. Who are Solon’s minimum wage workers? We don’t really know. They may be clients of the food bank at the Methodist Church. They may be taking advantage of government programs like SNAP and Medicaid. They may be neighbors who just don’t want to talk about it. Unless arguments for and against raising the minimum wage consider actual people who take minimum wage jobs in Solon, they are a useless political construct among people who already have had more than their share of politics. This applies equally to city councilors, business owners who have come forward, and to out of town advocates.